You Can't Escape The Sonic Bomb Alarm Clock | OhGizmo! There’s few sounds I hate as much as the standard electronic beep of an alarm clock. So I think my body has managed to tune them out with some sort of defense mechanism that also serves to help me sleep through the alarm those rare times I need to wake up in the morning. For people like us there’s the Sonic Boom Alarm Clock that guarantees to wake you up using a couple of extreme approaches. First off there’s an ear-deafening, neighbor-angering 113db alarm that will go off when it’s time to get up. Keep in mind that a jet taking off 200 feet away is rated at 120db so if you don’t end up having a heart attack odds are the alarm will wake you up. But if for some reason that still proves ineffective there’s also a ‘super-charged’ bed shaker you place under your pillow that will basically shake you awake and guarantee you’ll be in a great mood the rest of the day. 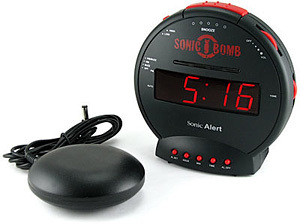 The Sonic Boom Alarm Clock is available from Zsuaro.com for about $58. erm… or $39.99 from ThinkGeek!